Philadelphia Police Commissioner Richard Ross leaves a news conference after announcing that Officer Ryan Pownall, a 12-year veteran of the force, would be fired. A Philadelphia police officer whose fatal shooting of a man running away from a traffic stop generated a wave of angry protests has been suspended from the force and will be fired, Commissioner Richard Ross announced Thursday. Citing a host of departmental violations, Ross said Officer Ryan Pownall, a 12-year veteran of the department, displayed "poor judgment" in firing his gun at David Jones, who had been riding a dirt bike and illegally carrying a gun when Pownall pulled him over in North Philadelphia in June. Ross said surveillance video showed that Pownall unloaded shots when Jones had his back turned to the officer and was between 10 and 35 feet away. Although Pownall clearly thought he was in danger, Ross said, he had an obligation to reassess the chaotic situation on a busy street as Jones, 30, who had dropped his gun, began to run. "There were serious policy violations that were committed — ones that were on video," Ross said during a news conference at Police Headquarters. "It's not even a question of what someone's perception was vs. another's. I saw it. The shooting investigators saw it. And that's where it starts and stops." The dismissal is the latest development in the months-long fallout from the shooting, one of three incidents this year in which Philadelphia police fatally shot someone. Activists (from left) Rowena Faulk, Isaac Gardner, and Asa Khalif demonstrate outside Police Headquarters after the announcement of Officer Ryan Pownall’s firing. A small group of protesters — who drew the ire of the police union for staging a profanity-laced demonstration outside Pownall's Bustleton home last month — vowed Thursday outside Police Headquarters to continue their provocative tactics unless Pownall is arrested. "This is a good step," said Isaac Gardner during an impromptu demonstration after Ross' briefing. "But [Pownall] needs to be charged with murder." The state Attorney General's Office is overseeing a criminal investigation into the incident. A spokesman said Thursday that the probe was continuing. Attempts to reach Pownall were unsuccessful. John McNesby, president of Fraternal Order of Police Lodge 5, did not return requests for comment. At a rally at FOP headquarters last month, McNesby blasted protesters for their actions outside Pownall's house. One of McNesby's comments — in which he called the activists, many of whom are black, a "pack of rabid animals" — drew criticism from Mayor Kenney this week. City Council President Darrell L. Clarke said in a statement Thursday that he supported Ross' decision to fire Pownall. 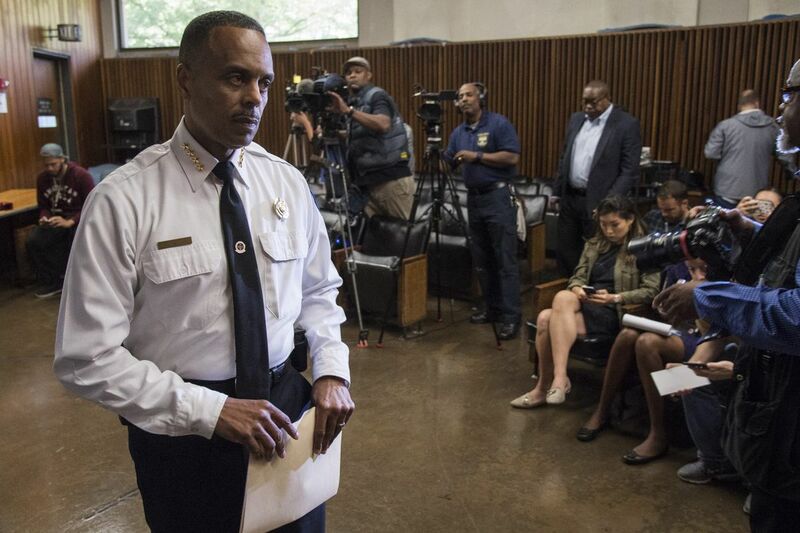 "I thank Commissioner Ross and Philadelphia police administrators for their serious and thorough consideration of the shooting death of David Jones," Clarke said. Pownall’s shooting of Jones on the 4200 block of Whitaker Avenue on June 8 generated controversy almost from the day it happened. Pownall was driving people to the Special Victims Unit in North Philadelphia to be interviewed in an unrelated matter. When he encountered Jones on a dirt bike — which cannot be driven legally on city streets, and which police later said Jones was driving recklessly — Pownall pulled him over. During the traffic stop, police said, Pownall felt a gun in Jones’ waistband. Jones could not have legally owned the weapon due to previous criminal convictions. Police have said Jones then reached for the weapon while scuffling with Pownall, but took off after breaking free. Philadelphia Police Commissioner Richard Ross at the news conference at which he announced the firing of Officer Ryan Pownall. Ross said Pownall's first attempt to shoot at Jones was justifiable under department policy, because it took place immediately after the struggle over the weapon and with reasonable belief that Pownall's life was in danger. But Pownall's gun jammed, Ross said, and he had to fix it to fire it again. During that time, Jones, who had dropped his gun, was able to get at least 10 feet away and had his back turned to Pownall, the commissioner said. That interval should have allowed Pownall to determine whether using a gun was appropriate, Ross said. He also faulted Pownall for failing to call for backup when he made the stop, and for escalating the danger of the situation as witnesses sat in his car. "Just because you had an opportunity and you had the right to fire at one point during an encounter does not mean you have that same right to do so throughout the encounter," Ross said. "There's an obligation to reassess the situation." While the department investigated this summer, activists calling for Pownall's firing and arrest disrupted city offices and news conferences, and staged the protest outside his home. That demonstration led the FOP to sue the city in an attempt to prevent the department from releasing the names of officers involved in shootings. Ross said Thursday that the protest outside Pownall's home was "out of bounds" and crossed a line. Gardner and fellow activist Asa Khalif said they would not rule out returning to the block to demonstrate again if Pownall is not arrested. Pownall was involved in another shooting, in 2010, which activists often cited as further reason he should have been dismissed. In that case, Pownall and other officers fired at Carnell Williams-Carney, who also ran from police after being stopped with an illegal gun. Williams-Carney was struck in the back by a bullet that Pownall later said he fired. Williams-Carney was paralyzed from his injuries. Pownall and the other officers remained on the job. In a federal civil suit filed by Williams-Carney, a jury ruled in 2013 that the officers were justified in opening fire.